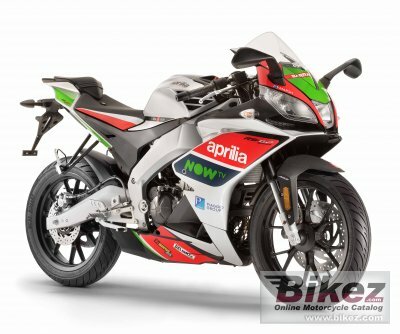 2018 Aprilia RS 125 Replica GP. Picture credits - Aprilia. Submit more pictures. The beating heart of the Aprilia RS 125 Replica GP is a modern and technological 125 cc single-cylinder, 4-Stroke, 4-Valve electronic injection engine with liquid cooling: reliable on the road and powerful on the track, it has particularly refined technologies such as double overhead camshaft timing (DOHC). Clutch: Multi-plate in oil bath. Driveline: Primary drive: Gearbox: 63/19 (3.31). Final drive: Chain: 17/40 (2.35). Rear suspension: Asymetric swingarm. Hydraulic monoshock with adjustable spring preload. Ask questions Join the 18 Aprilia RS 125 Replica GP discussion group or the general Aprilia discussion group. Bikez has discussion forums for every bike. View comments, questions and answers at the 2018 Aprilia RS 125 Replica GP discussion group. You can sign up for e-mail notifications when other riders answer you. If you have extensive experience with the MC, please send us a review. If you consider buying this bike, you should view the list of related motorbikes Look at photos. Compare technical specs. And check out the rating of the bike's engine performance, reliability, repair costs, etc. You can compare the rating with other bikes.